WORCESTER, Mass. 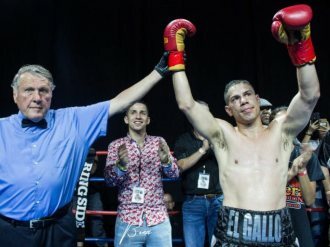 (August 19, 2018) - Seven years after his last fight, "El Gallo" Jose Antonio Rivera returned to the ring in grand fashion last night (Saturday) to headline "Homecoming, presented by Granite Chin Promotions in association with Rivera Promotions Entertainment, at The Palladium in Worcester, Massachusetts. The 45-year-old Rivera (42-6-1, 25 KOs), 35 pounds lighter than he was in February when he started training, packed the house in his hometown, fully entertained his supportive fans. Three-time, two-division world champion Rivera pressured Larry "Slomoshun: Smith (10-38-1, 7 KOs) from the opening bell and he never let up. "I've always been tough," Rivera said after the fight, "but I was a little rusty. He tested me early but, once he saw I wasn't going anywhere and knew he was in for a fight. I started warming up in the fourth round. I was always a 12-round fighter. I didn't know he broke his hand until after the fight. I feel great. We gave a good fight to the fans who have always supported me." "I give myself a C+ tonight. I'm going to talk with my family, but I'm thinking about one more fight, to make it 50 for his pro career)." Southbridge, MA junior middleweight Wilfredo "El Sucaro" Pagan (5-0, 3 KOs) remained undefeated, using a relentless body attack to drop Engelberto "Guarura" Valenzuela (11-15, 3 KOs) three times, the last ending the fight midway through the third round. Worcester welterweight Eslih Owuso (1-0) pitched a shutout in his pro debut, decking veteran Bryan "The Brick" Abraham (6-31-2, 6 KOs) twice in the second round, en route to a unanimous decision win. In the opening bout of the night, 45-year-old Jose Angel "KO" Ortiz (5-14-1, 2 KOs) dropped Patrick Leal (0-5) 10-seconds into the fight, once more later in the opening round, and stopped him in the second. Oritz, fighting out of Springfield, MA by way of Puerto Rico, was fighting for the first time in five years, and he registered his first victory in seven. Bank, Pamela Laporte Realty, Worcester Vocero, ChrisFIT Xperience and Grille 57.